Well, going into this whole “tell why I like the turtle franchise” series I knew that I was going to have to confront what is almost universally known as the worst of the bunch. Teenage Mutant Ninja Turtles III uses the ever popular time-travel-trope in an attempt to maintain the momentum that the first two movies managed to generate. I feel like a review of the movie isn’t going to help my case for why I love this series, so rather, I’ll give a brief synopsis of the film and then a list of why it was actually, somewhat enjoyable to see the Turtles succumb to a new level of mediocrity. Turtles in Time as I’ve come to call it, mostly due to the NES game that far surpasses the movie, presents us with our favorite heroes in a half-shell shortly after they’ve defeated Shredder for a second time (and this time for good). April is en rout for a much needed vacation, and, for reasons I will never be able to understand, decides to give the Turtles some radical (read: terrible) gifts from a flea market before heading out. Among the random assortment of thrift store rubbish is an ancient scepter that she thinks looked Japanese, so she naturally picks it up for Splinter. Naturally, things go horribly wrong when the scepter turns out to be an ancient time machine that hurtles April into ancient Japan, while simultaneously throttling the emperors rebellious son into the future in her place. No surprise, the Turtles head back after her, leaving a slightly confused Casey Jones to watch over the emperors son, as well as four of the emperors royal guards who swapped places with the turtles. A number of challenges await the turtles in the past, namely finding April and the time scepter so they can get back home. There is also the rebellion they decide to help out… since they’re in town. The Turtles find themselves face to face with a group of traders that seek to bring firepower to the side of the oppressive emperor. That’s the long and the short of it, and I’ll just give you a quick heads up on some of the negative aspects of it. The script and dialogue is worse than the other two films combined, the turtles aren’t done by Jim Henson so they look weird, the time scepter plot makes less sense than the turtles origin story and the ridiculousness level is at an all time high. That’s just to name a few problems, but what makes it worth watching? Lets do this in list form, shall we? Higher Production Value: You’re not going to be watching the best period piece by any stretch of the imagination, that’s evident by the majority of the actors they hired. Still, it was pretty fun seeing all the sets and costumes look like they jumped out of ancient Japan. The traders even added a little swash-buckle to the franchise, and that’s always nice. Casey Came Back: Casey Jones’ absence from Secret of the Ooze, was inexcusable. He was easily the most entertaining part of the first movie, and he’s back in the third one. It’s a shame his role is slightly watered down and takes second fiddle to the main plot, but he brings about the few laughs that the film has to offer as the babysitter of ancient warriors in modern day New York. It’s Still the Turtles: The movie wasn’t great, but it hadn’t sunk to a level that the poorly made live action TV show would become. Most of the bad dialogue and corny jokes are excusable because the this franchise is so unique. Very few studios would take on a project like this. 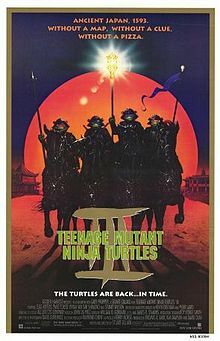 A live action film about four mutant Ninja Turtles going back in time to aid a rebellion in ancient Japan doesn’t really sound like something you would see outside of the SyFy channel; but this was different, everyone in 1993 wanted to see just that. It’s sad to see the franchise sink to the level that Turtles III sank to, however it isn’t without it’s merits. We get a chance to see the turtles in a new environment fighting new enemies with some overly formulaic jokes and pop culture references. It’s certainly worth watching, at least once while powering through the four movies that comprise this series. Sure, it’s the film that stopped production of TMNT movies for a solid 14 years, but it wasn’t the end for the Turtles quite yet. This entry was posted in action, comedy, Comic Book, Family, Fantasy, Science Fiction, Super Hero and tagged Action, Adventure, Comedy, Daniel Robison, movies, Popcorn and Peril, Teenaged Mutant Ninja Turtles, TMNT, Turtles. TMNT 3 was probably my favorite, followed closely by TMNT 2. I think it also inspired my love of all things Japanese. For me it hit every note just right and I still often quote, “There no life in him!” at appropriate times. It didn’t take it self to seriously, a feat since it centers around Japan, and it was a high adventure – just like the Turtles would go on. Maybe watching it again would change my mind, but more than likely it’d be like seeing an old friend again. Thanks for the write up. Oddly enough, it’s my mothers (She was actually born in Japan, my Grandmother being Okinawan) favorite of the bunch, and my wife (on a very recent viewing of all the films) liked it far better than Turtles 2. Growing up I didn’t know it was as poorly received as it was. I certainly enjoyed this movie more viewing it as a child, but you’re right, the whole series is like visiting an old friend, albeit one that tells the same stories over and over. It wasn’t very hard to make a write up of the aspects I enjoyed about this installment, despite it’s short comings. I need to watch this one again because when I was a kid I really disliked this movie, and I was not a discerning 11 year old, so it stuck in my mind that this movie must have been really bad.